Tioga County is well known for their 50-mile Pennsylvania Grand Canyon, which exhibits a portion of the vast beauty within the county. Surrounded by approximately 165,000 acres of the Tioga County State Forest, the Grand Canyon attracts many tourists each year. 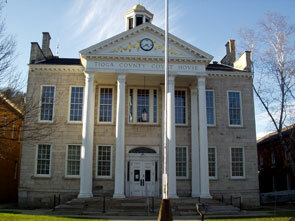 Tioga County also boasts Hills Creek State Park, 2 federal parks and the Pine Creek Rail Trail. In addition to outdoor activities, the County also offers the Endless Mountains Music Festival, with concerts held in several locations in or near Wellsboro or Mansfield. Just twelve miles from the PA Grand Canyon is Wellsboro, the county seat, and a town with charming, historical appeal to all who visit. In addition to the tourist attractions in Tioga County, the future I-99 Corridor, currently US Route 15, provides access to I-80 and I-86, major transportation routes. The county’s 41,981 residents live across 39 municipalities and 1,134 square miles. Education, health and social services constitute the largest industry in the county, while manufacturing, retail trade and construction also have a significant presence.